Circle evolved from my memory of a decision-making game that I liked as a child called Fortune Teller, where the players must first choose a colour, then a number, which in turn would determine their fate and the hidden task in the middle. I created hundreds of Fortune Tellers, played around and manipulated them until I discovered Circle. I began this process by photographing interesting and repetitive geometrical patterns found in the built urban environment: the lines and angles of a roof, the patterns embedded into a cobbled street and the layers and forms created by a stack of newspapers. I realised that all these elements exist because someone had made a decision to create them, that life is built around hundreds of seemingly small, insignificant decisions to create a greater whole and that it is ongoing in nature. The process of making hundreds of small decisions everyday determines the shape and form of our lives. 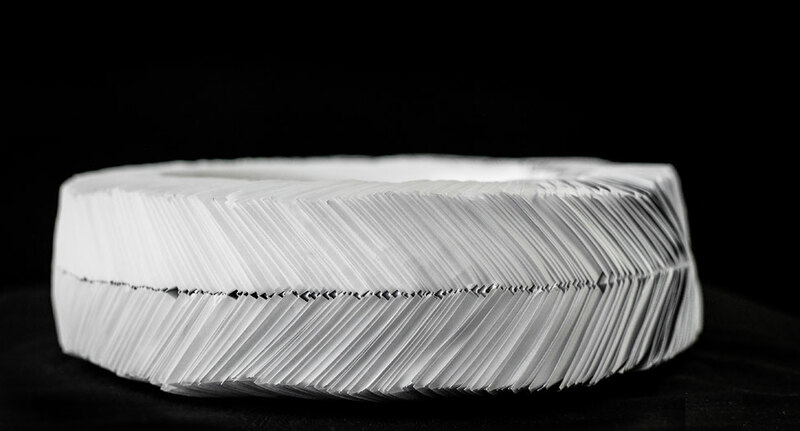 Circle is a metaphor for this process where the small individual forms of the Fortune Tellers brought together create the shape and form of the finished sculpture. 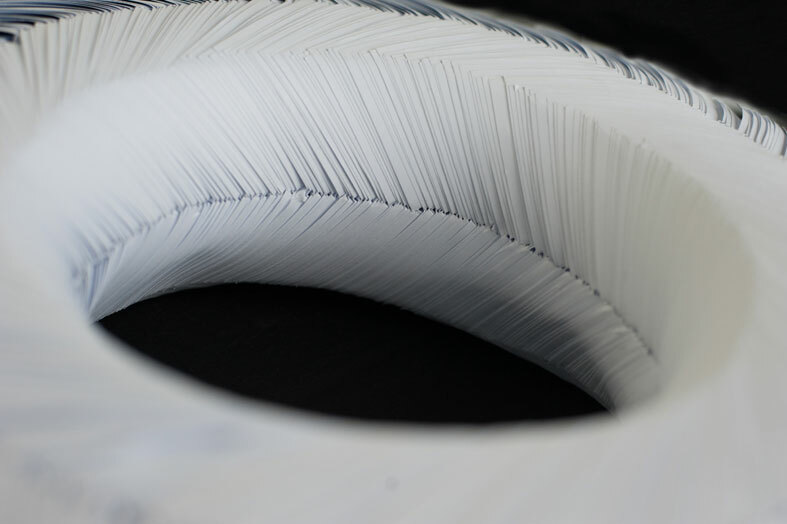 Circle consists of over 400 individually cut and handmade origami Fortune Teller forms made from white paper glued together with ethylene vinyl acetate and manipulated into a circle to create the final structure. The piece took over 50 hours to create. Fiona Hueston is a multi-disciplinary artist with work spanning installation, sculpture and photography. She derives inspiration from the shapes and forms around her and use different disciplines and materials to create her pieces. 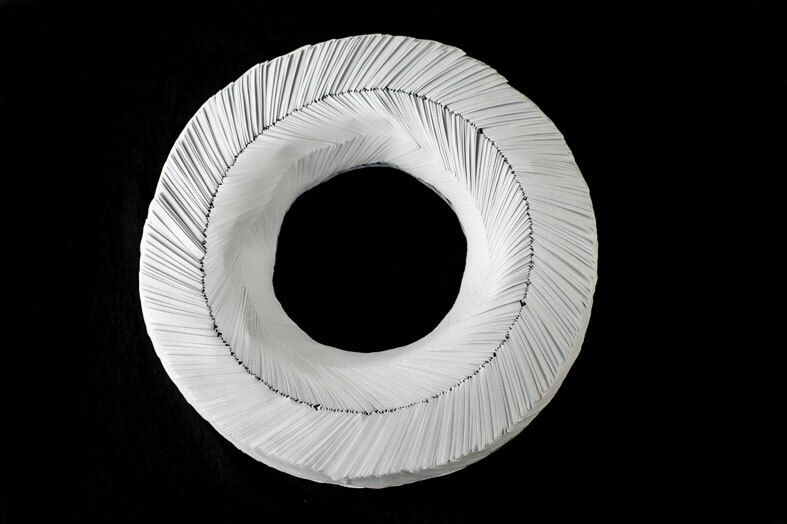 Fiona's current projects incorporate photography, paper, installation and painting. The aim of her work is to create pieces that are ascetically interesting, thought provoking and encourage people see and experience the world a little differently. Fiona graduated from College of Fine Arts, University of NSW with a Master of Cross Disciplinary Arts and Design, and holds a Bachelor of Arts in Art History at Griffith University. Her work was exhibited in group exhibitions since 2007. In 2014, she had a solo exhibition – The Equal Hearts Project, The Pop Up Store Collective. Fiona Hueston, in conversation with Professor Ian Howard, discusses her work Circle and answers questions from the audience. Recorded on 10 October 2015 at the exhibition.